The Junior Rebel Officer wears a khaki jacket and peaked cap. Unlike the Generals, his jacket lacks rank insignia. 2. 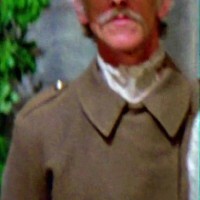 Light tan scarf worn tucked inside the collar of the shirt. 4. Olive drab canvas (non-nylon) military style belt with metal grommet holes and a metal latch. 5. Dark tan/khaki pants with no visible pockets. Pants and jacket must be made of the same fabric. Pant legs should be long enough to cover the shoelaces. 6. Black, flat soled shoes or boots.